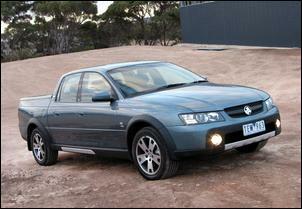 The Holden Commodore family car has morphed into some pretty interesting vehicles in recent years. But none as elaborate and gargantuan as the Crewman Cross 8. The sheer size of the Crewman Cross 8 cannot be understated - this is not a vehicle to drive into the city on a regular basis. Tight manoeuvring can spoil your day and city parking is a nightmare. At 5.3 metres, the Crewman Cross 8 is overkill for many situations. But the extra cab room of the Crewman is a real bonus for tradespeople who were previously limited to carting only one or two passengers. 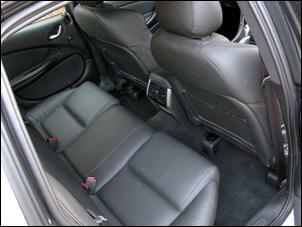 And that’s how the rear seat should be regarded – as a bonus. Despite recent alterations to rear seat positioning, the rear backrest is awkwardly upright and knee room is limited when the front seats are slid to accommodate anyone over 185cm tall. Rear seat egress is also not a fluid motion. The closeness of the back seat to the B pillar means you need to swivel your legs out and then guide your work boots through the relatively small opening. 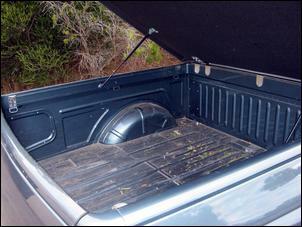 And, inevitably, that rear seat doesn’t magically appear without a sacrifice - the rear cargo area is reduced. Although using the same 3.2 metre extended wheelbase as the Holden 2-door one-tonner, the Cross 8 has a relatively short cargo tray giving a maximum vehicle payload of 743kg (that number includes occupants). It’s likely the Crewman has enough cargo capacity to satisfy most tradies but it’s important to be aware the Crewman doesn’t have the highest payload capacity in the Holden range. But when it comes to towing, the Crewman Cross 8 is at the top of Holden’s list. With its constant AWD, heavy-duty leaf springs, upsize brakes, V8 grunt and a high-torque automatic trans, the Cross 8 is rated to tow a load up to 2500kg. In comparison, a Ford Courier 4.0 litre Crew Cab is rated at 1800kg while the truck-like F250 is rated to 3500kg. Our only criticism of the Crewman chassis is the awkward ride caused by the semi-elliptical leaf spring rear suspension. Stepping out of a normal Holden sedan, this is immediately noticeable. From an off-road perspective, the Crewman Cross 8 offers a widened track (so you can follow in the ruts created by Patrols, Landcruisers, et al) and decent ground clearance. 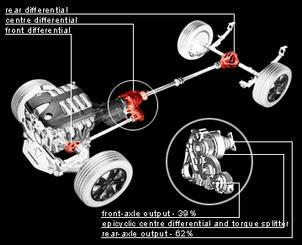 But peer below and you’ll see the driveshafts, diff and rear springs are exposed for a meeting with A Big Rock. Use the Crewman Cross 8 for dirt tracks and accessing your favourite beach spot and you won’t have any trouble. 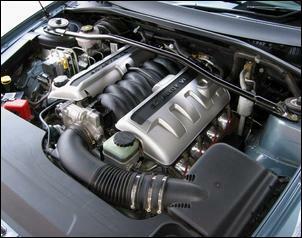 Under the bonnet, the Cross 8 packs a 5.7 litre LS1 V8 tuned to deliver 235kW and 460Nm. It benefits from a VZ-series large diameter air inlet, revised engine management and electronic throttle control. It’s a relatively quiet and fuss-free engine giving effortless performance. We recorded a 0 – 100 km/h time of 8 seconds. The Crewman is available only with a 4-speed automatic transmission – and the Cross 8 scores the heavy-duty 4L65 version. The trans is well matched to the output of the engine but the lack of a sequential style shift mechanism is a constant frustration. On countless occasions we reached over to bump back the trans a cog or two. And what of fuel consumption, you ask? During our test, we recorded an alarming 19 litres per 100km in urban/city conditions and around 17 litres of unleaded with open-road driving. It’s fair to say the Cross 8 has an insatiable thirst. And note that Holden really needs to upgrade the existing 68 litre fuel tank capacity: this is a severe limitation for long distance touring. 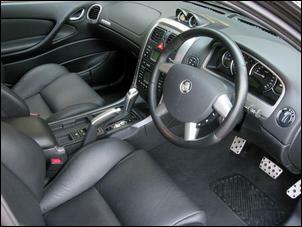 On board, everything looks familiar to a Holden Commodore driver. The Cross 8 receives single-zone climate control, smooth cruise control, a sports leather steering wheel, 6-stack CD plus front and side airbags. A gauge pod containing an oil pressure and battery voltage meter is also added. Visually, the stretched and raised Holden doesn’t need any add-ons to make a statement. But, just to be sure, the Cross 8 gets noticed thanks to its sports body kit with wheel arch flares, fog lights and projector headlights. 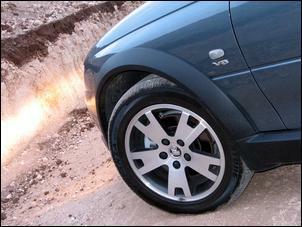 Wheels are heavy-duty 17 x 7.5 inch alloys wearing 225/55 Bridgestone Turanzas. A 16 x 7 steel spare wheel is mounted below the tray. So does this heavyweight Holden come with a beefed-up price tag? 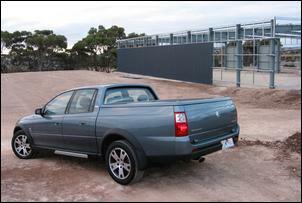 Well, it’s no surprise the Cross 8 cost substantially more than a base Holden ute – the big Holden checks in at AUD$52,290 (plus the optional leather trim and hard tonneau cover fitted to our test vehicle). But it’s not a bad purchase given the excellent AWD system, V8 grunt and the uniqueness of it – certainly, there’s nothing on the market that’s a direct competitor. But at over 50 grand, buyers can expect a high level of build quality. And while our test Cross 8 was fine overall, it did have a clunk from the front-end, another intermittent clunk from the driveline and the ‘satin chrome’ finish on the gear selector was flaking away. There are a few areas for improvement but the Cross 8 is a good buy for tradespeople wanting that little bit of extra flexibility... if they can stand the thirst.